Paul Deltombe was born north of France in a small town, Catillon-sur-Sambre. His talent for drawing was noticed at 14 though his passion was philosophy. Due to ill health he was prevented from going away to university and instead to devoted himself to art, enrolling at the Ecole des Beaux-Arts in Lille under the tutelage of Pharaon de Winter. In 1900, the young Deltombe was accepted into the Ecole des Beaux-Arts in Paris where he studied under Bonnat and Robert-Fleury. At the same time, he attended the Académie de la Grande Chaumière where he met Signac, Matisse and Luce. He debuted at the famous Salon des Indépendants in 1902. He flourished during this decade in his life, being elected to the committee of the Indépendants, alongside Signac and Dunoyer de Segonzac, and exhibiting regularly at the Salon d’Automne. He subsequently secured the famous Russian collector Ivan Morozov, whose collection is now divided between the Hermitage and the Pushkin Museum. In 1912, Deltombe married Yvonne Berthaud and moved to Nantes, his bride’s hometown. They moved around in France and traveled to Italy where they became enamored with the old masters. The war moved them back to Nantes where they designed tapestries for the renowned Aubusson. He and his wife patented a special stitch, which is still called the ‘point de Nantes.’ Their method was also innovative because it incorporated a method of numbering wool colors. He was also instrumental in bringing talent from Paris that revived the previously out-of-date Aubusson. In 1921, the Deltombe family purchased a country house near Nantes in Champtoceaux. He regularly retreated to this rural isolation where a key part of his oeuvre was created. In 1926, six paintings were included in the retrospective of the Salon des Indépendants, who elected him Vice-President in 1931. In 1940 he was appointed Director of the Ecole des Beaux-Arts in Nantes, where for 3 years he took a very active teaching role, acquiring many followers. As a member of the Nantes Museum Commission he was instrumental in acquiring important works by his friends Albert Marquet, Louis Valtat and Maurice Denis. In 1947 Deltombe emerged from his artistic isolation at Champtoceaux to renew contacts with the art world, both among the Parisian galleries and with the Salons to which he began sending his work once more. He moved to the South of France in 1955 with his wife to be nearer his daughters and paint. The South of France provided the perfect subjects for Deltombe’s later period, with the rich terracottas and deep blues of the Mediterranean coast shimmering under a clear bright light. 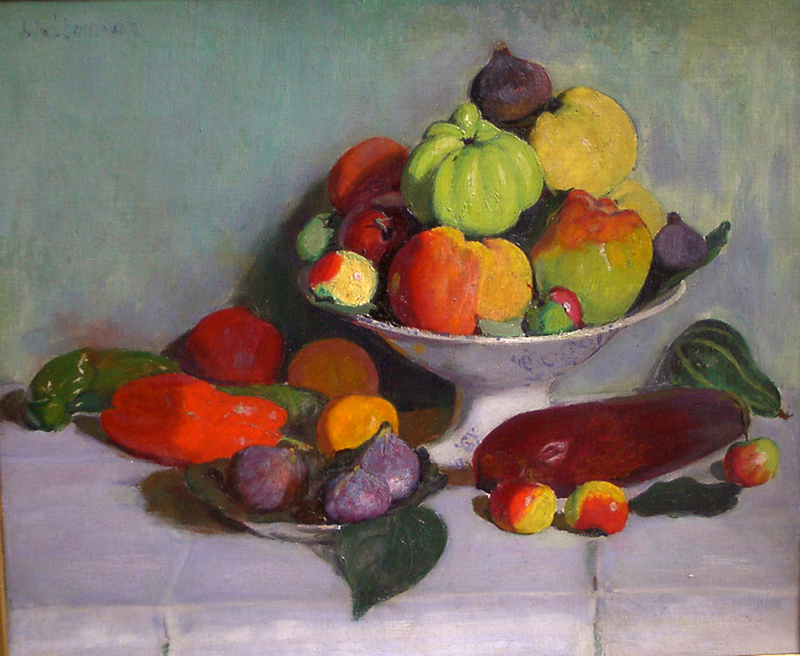 Yvonne Deltombe, the artist’s wife, died in 1962. A large retrospective of his work was organized in 1970 at the museum of Nantes with a catalogue by Robert Vrinat. Paul Deltombe died in 1971 at Champtoceaux, aged 93, surrounded by his family. Retrospectives of Deltombe’s work were organized for many years after his death: 1972 at the Galerie Jaubert in Faubourg St. Honoré, Paris; 1973 at the Musée Paul Valery in Sète, South of France; and 1974 at the Palais des Congrés in St-Jean-de-Monts, Brittany. Deltombe was again celebrated in 1992 at the Château de Sédières, Limousin with an extensive retrospective. The Museum of Nantes has ten of Paul Deltombe’s paintings, with others in the Musée d’Art Moderne in Paris and the Pushkin Museum in Russia. Further examples are in the provincial museums of Douai, Le Havre, Lille, Maubeuge, Sète and Valenciennes. The town planners of France have chosen to award him the very public accolade of a Rue Paul Deltombe in Nantes and a Place Paul Deltombe in Champtoceaux.